Making croutons is very easy and it is a great way to use up your old bread! They are a delicious addition to many salads or sprinkled on soups to give your dishes that lovely crunch. You can use any of our Monash certified breads for this recipe to ensure your croutons are low FODMAP. The croutons are also easy to store and will keep for more than a week (see the tips below). Heat enough oil in a wok or frypan over a medium heat until hot. To test if it is ready drop in 1 crouton and see if it starts to sizzle. 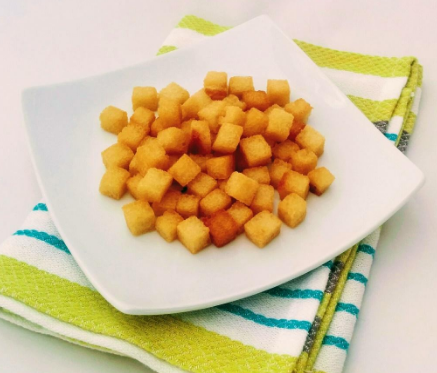 Fry croutons (1 handful at a time) and constantly turn and move croutons in the oil with a slotted spoon until they are golden brown (this takes about 3 minutes). Immediately remove them with the spoon to drain on plenty of layers of absorbent paper. Line a baking tray with baking paper. Sprinkle croutons in an even single layer and spray with olive oil. Carefully turn the croutons and spray on the other sides ensuring they are lightly coated with oil. Bake croutons for about 10 minutes until they are golden brown. You may like to remove the tray during the cooking and move the croutons around to ensure they cook evenly. The croutons are easier to cut when the bread is a few days old. Make sure you use a very sharp knife. To store the croutons, wait until they are completely cooled and place in an airtight jar with absorbent paper inside its base. Sprinkle croutons with low FODMAP herbs or spices during cooking for extra flavour. Croutons can be used in salads like Caesar, fattoush and green salad leaves. They are also a delicious garnish on low FODMAP soups such as Jap pumpkin, parsnip, chicken soup, carrot or capsicum – use the app and your imagination!